Yesterday was the Jason Wu fashion show, completely dominated by the polished, ladylike look with a emphasis on tailoring. 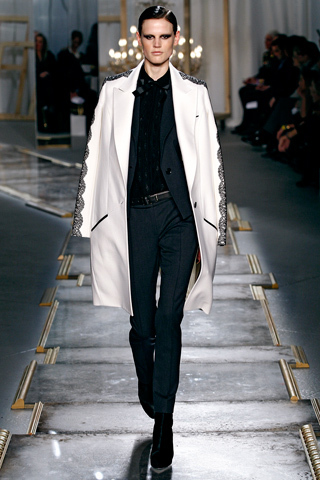 Coats were flung over the shoulders for a casual and powerful effect. Some keyitems of the collection were: a printed blouse, cigarette trousers, a cropped blazer, a sweater, a leather skirt and of course a lace mask, seen on several models. Today on the Fashion Week schedule are include ADAM, Charlotte Ronson and G-STAR RAW.